Call A to Z Entertainment, Inc. today for free information about how to hire or book Christian rock music singers, Third Day. With over twenty years of successful experience, we are your best agent and agency for booking and hiring live Christian rock band Third Day! We book or help you hire any live professional entertainment you want, to include – Christian musicians and Christian music rock singers and live bands. We can also help you plan and produce your show or event, so call us now at 888-655-4575 and we’ll be happy to help you. The advice is always free from A to Z. Third Day has clearly weathered the difficult climb from obscurity to success, but the band is hardly suffering from over-confidence or complacency. In fact, the band’s eleventh album, Revelation, addresses that very issue head-on. Rather than lean back in a figurative easy chair, Third Day challenged itself immensely, shaking up its direction and reasserting its place as a rock band of enormous depth and passion. 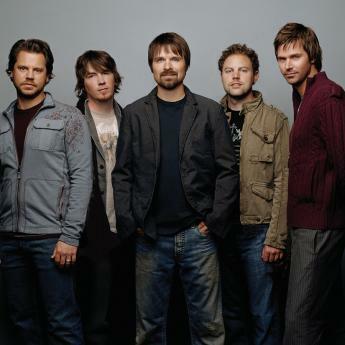 Influenced by the Southern rock of Lynyrd Skynyrd and other artists such as U2 and Rich Mullins, Third Day was originally formed by vocalist Mac Powell and acoustic guitarist Mark Lee. The duo added bassist Tai Anderson and drummer David Carr from another local band, and recorded some demos. Third Day’s live shows gradually built a loyal fan base, and just after lead guitarist Brad Avery joined, the band signed to Gray Dot Records. Their eponymous debut followed in 1996, with Conspiracy No. 5 appearing a year later. In 1999 Third Day returned with Time, and the next year, Offerings, a collection of new and live material, came out, followed in 2003 by its companion, Offerings II: All I Have to Give. That same year, the American Music Awards tapped them with a nomination in the Favorite Contemporary Inspirational Artist category. For their fifth studio album, 2004’s Wire (which was followed shortly after by Live Wire), Third Day returned to their rock & roll roots, a trend they kept up for 2005’s Top Ten hit Wherever You Are, which came out in CD/DVD format the next year. After the release of the holiday album Christmas Offerings in 2006 and the compilation Chronology the following year, the band announced the departure of Avery in February 2008. Despite the loss, Third Day soldiered on, releasing Revelation in July of that year. The album was produced by Howard Benson and featured appearances by Chris Daughtry and Lacey Mosley. Third Day won the American Music Award in 2008. We can help you book or hire any Christian rock musicians and any live Christian rock bands. We’re your best agency and agent for booking and hiring Christian rock singers, Third Day, so call 888-655-4575 today and we’ll be happy to help you. A to Z Entertainment, Inc. is not the exclusive booking agency for any live entertainers on this site.